Susan Orlean has become a geek, something that simultaneously amuses and mildly horrifies her. Orlean has been a staff writer at The New Yorker since 1992, and is known for her richly detailed features about places and people. Orlean’s focus is often on individuals outside the public eye, whom she dissects in the gentlest of ways to reveal what makes them tick. Her book The Orchid Thief, looking at how orchid collecting and cultivation leads people to odd acts, was made into the quirky film "Adaptation." Lately, however, Orlean has been tearing up the techie side of things. The writer, who lives with her husband and 5-year-old son (and 10 chickens) in the Hudson Valley in New York, has amassed 70,000 followers on Twitter, and writes regular blog entries for The New Yorker. Orlean used Twitter to document her anticipation of a 3G iPad, and its ultimate arrival. As a part of our "Living with iPad" feature story in the September 2010 print issue of Macworld, we caught up with her a month after she’d received her 64 GB model. She is currently at work on a biography of dog movie star Rin Tin Tin. I can’t really picture you with a laptop out trudging through the swamps and bogs in Florida. What was your setup before this last few weeks? So I bought a little netbook, an ASUS netbook… Laptops are portable within your house, but they’re not so great for carrying around. And they don’t have great battery life, which is a significant thing if you’re sitting on a plane or a train where you don’t have electricity available easily. So the netbook seemed like a brilliant solution. It was small, it was really light, it went for such a long time without a battery. I started working just on my iPhone, which by that I mean I would check my email, and do Twitter and Facebook. But I couldn’t do anything. I could read things that I had put in Dropbox but I couldn’t actually do anything beyond that. But I was often traveling with my iPhone rather than my MacBook because I just didn’t want to schlep around something heavy. Well, I was mystified because before my iPhone I had a Treo, and I had a keyboard, and I actually worked on that a fair amount. I thought, Wow, it’s not ideal but the keyboard was good, and I could work and I did work on it a fair amount. But I was puzzled. I felt this seems like the most natural thing in the world that you would have a keyboard for the iPhone and I didn’t quite understand that. Had they developed just a keyboard, my avidness for the iPad would have been a lot calmer because the huge issue for working on the iPhone was just, I’m a really good typist and I’m even a really good thumb typist, but there’s a limit to how much you can do. But in addition, I began reading a lot on my iPhone. I got the Kindle application and I stopped using my Kindle, and I was reading books on the iPhone. And I actually didn’t find it to be that much of a problem. I read tons of books on it. But in the back of my mind I always thought, Wouldn’t it be great if there were a jumbo iPhone, because I was really very happy with everything the iPhone could do but the size limited some of that just in practical terms. …I’ve just recently done my first couple of trips just with my iPad and no laptop. And except for the problems with Flash, which I don’t care who says that it’s not a problem, it is a problem. Something has to change because that’s ridiculous. This was your trip out to WITS in Minneapolis? [Orlean was interviewed in front of an audience by John Moe, the host of American Public Media’s Future Tense at the Fitzgerald Theater in St. Paul. The interview will air on public radio stations in the summer.] How did it turn out to be what you needed on the trip? I was already feeling sort of very braggy, thinking, “Oh, this is awesome.” Two hours of wasted time that I can now use, which was great. I didn’t have to take it out of my luggage, which I loved. Not that it’s a big deal, but flying is such a pain in the neck now that anything that you can eliminate as far as the headache of going through security is wonderful. The fact that I didn’t have to give the battery one moment of thought on the plane was great. And that it was light and it just was great. And the fact that I have on it my whole iTunes library. I didn’t download any movies. I could have and I wish I had because they didn’t have any on the plane. But I was really happy. And I worked in my hotel room. They did not have Wi-Fi. … I keep my manuscript in Dropbox. I was able to open the Dropbox file and work on it in [Apple’s] Pages; getting it back to your computer seems like it ought to work a little more easily than it does. Dropbox doesn’t allow you to email things into Dropbox. … I know that they are being hounded by people to offer that option. But it wasn’t such a big deal when I got home, I plugged in the computer. I dragged the file into my Dropbox and that was that. I feel like there’s still a few things that don’t make perfect sense or aren’t quite as seamless. But I was really happy with it. And I was so happy not carrying a heavy laptop. It’s not that iPads are so light. But I can keep it in my handbag. I think for women, they’re great. Because I always have a handbag. My husband wanted to get one, and he was sort of going back and forth. Because he doesn’t carry a briefcase. He wasn’t quite sure that he wanted to commit to having to carry something. But I have a feeling that he’ll end up getting one once he finds some briefcase kind of thing that he is comfortable using that’s light, like briefcase ish rather than handbag ish. So it was great. I actually think that it is ideal for women and children. I have a good video of my three year old playing Pickin’ Time on an iPad. It’s an iPhone game at double the size. And he’s, like, this is the best thing since sliced bread. And I thought, well, there you have it. Like a lot of these things like reading The New York Times in bed. I hate sitting there with my laptop. I don’t know if it’s just the laptop is hot, it’s heavy, and makes me think that I ought to be working. … I can see why some people would scratch their head and say I don’t understand how it makes sense. I have my laptop and I have my phone. I can understand that, too. I think it’s like carrying around like a little window with you, and you can peak through that window into this huge gigantic world that is the Internet. And while you can do that with your phone, it is so much more visual, and almost tactile and alive doing through the window, the iPad. And that’s how I feel. I just feel like it’s a window. Literally, it even looks like a window. I’ve heard from a lot of people talked about how it disappears; the iPad when you use it, there’s nothing there. You are conscious you are holding a device but there is no other anything there. But that’s why to me the analogy or the metaphor of a window feels very accurate. Because I feel like the Internet is like this ocean of information and images and communication. It’s just this vast, fluid, thing. And this is like the window onto the aquarium. Or rather you are in a tunnel underwater, and this is your window and through it you see this gigantic ocean and you can beckon what you want to that window. I was reading somebody’s rant about apps and they make you stupid and they put things there instead of making you go out and get them. And I just think, eh, get over it. If you want to be somebody who goes out and digs around online, good. Go do it. For the average person this makes the Internet a utility. You were talking about working on a manuscript. I know you are always out in the field interviewing people, gathering data. Is the iPad suited for that? Or are you still going to carry a notebook and a recorder? Well, I don’t really see it replacing that because I take notes with a pen and a pad and while there are pen and pad apps, I wouldn’t want to carry around a fairly valuable piece of technology when I’m out in the field, so to speak. I rather have my notepad and pen and not have to think about the technology. I don’t even like using a tape recorder because of not really liking the technology. I think the typing takes some getting used to and is still a little complicated.…If I’m sitting in bed and I kind of have it propped in my lap and I want to reply to email it’s still slightly awkward to type. I try to thumb type holding it vertically and I can kind of do that, and then I think, no no no, I’m going to type like a normal typewriter, and I turn it horizontally, and put it down on the bed and type. … I wouldn’t imagine that I’d want to take it and type notes in a interview. And I’ve never liked to do that anyway. I think it’s too weird to talk to someone and be looking at them and typing. I find it just really strange. Are you going to wind up using the iPad constantly, or can you put it down and walk away? I think, you know, that’s a good question. I do think I can walk away. I think that life demands enough of one’s attention that I don’t know whether having a kid is part of that, that there are just times when you’re just not online. And it doesn’t matter how glamorous a device you have, that’s just not what’s happening. I don’t think of the Internet as a danger. Its funny…we just bought a new car and we were looking at getting a DVD system, a built in one, factory installed. And they’re ridiculously expensive of course, and all they do is play movies. So a friend of mine said what a waste. Just get Austin an iPad. And that way if I get him just the small one without 3G, loaded up with a bunch of games and download some movies for him, it would take us like three years before we come close to the price that you pay for DVD. And she said its old technology anyway and it will be useless and they charge about $2,000 for them. …If you’re on a road trip and you have a $2,000 built in DVD player in your car, and first of all, all they can watch is DVDs. They can’t do interesting educational games, they can’t draw, all they can do is watch a movie, totally passive….and then you get to the hotel for the night and you go inside and you don’t have anything. You buy an iPad and you’re reading books, you’re drawing, you’re doing puzzles, you can watch a movie, and then you get to the hotel and you bring it in with you. …I’m not going to buy my son a laptop, he’s five. … I’ve got a ton of things for him to play and read and that isn’t what a laptop would do. Laptops are going to start seeming like work tools. And iPads will be the sort of interesting, exploratory, adventuring, device. And not so much work but functional for work. And laptops are going to start seeming really drab and functional but its interesting it wouldn’t have occurred to me to get a laptop for my son to use in the car. …He never asked to use my laptop, there’s nothing fun about that. Having followed you on Twitter for so long, it’s clear that you’re somewhat of a geek, but this seems to mark your transition for you into becoming more of a geek. John Moe said you were going to be reviewing gadgets for his Future Tense radio show. So are you going to forget about the international reporting, and wind up becoming a tech geek like the rest of us? Jonathan Seff finds the iPad has made his reading more enjoyable and more varied. 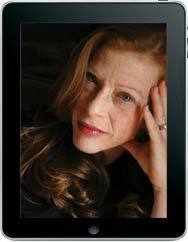 Glenn Fleishman interviews New Yorker author Susan Orlean on her love of the iPad.